Human enterovirus 71 has emerged as an important pathogen in the Asia Pacific region and it is important to be able to make a rapid and specific diagnosis for outbreak control. Recent Asian strains of Coxsackievirus A16 have changes in the VP1 gene which causes mispriming of widely used primers for human enterovirus 71 specific identification. Local strains of Coxsackievirus A16 were sequenced in the VP4 and VP1 genes and using sequence alignment tools, an improved set of primers were designed for specific identification of human enterovirus 71. These primers were evaluated against virus isolates as well as primary clinical specimens. A total of 218 virus strains were tested. All 39 human enterovirus 71 isolates were positive and none of the 38 Coxsackievirus A16, 127 other enteroviruses and 14 prototype flaviviruses and adenoviruses were positive when tested with the new primers. When aliquots of primary specimens known to have yielded human enterovirus 71 were retrospectively tested, we found that within 2 months of collection of the specimens, greater than 90% were positive but that the success rate diminished rapidly to 18% after 2 years storage. Our new primers will be useful in rapid diagnosis of human enterovirus 71 infection, and can also be used as a screening tool in surveillance programmes for early warning of human enterovirus 71 transmission. Hand, foot and mouth disease (HFMD) is an unremarkable illness that commonly occurs in young children. This condition is caused by human species A enteroviruses  most commonly Coxsackievirus A16 (CVA16) but has more recently been associated with human enterovirus 71 (HEV71) which can also cause neurological complications . In the most common manifestation which gives the syndrome its name, children typically present with vesicular exanthema on the soles of their feet, the palms of their hands and in their mouths, causing discomfort and feeding difficulties. CVA16 and HEV71 are also associated with herpangina, but this is often also caused by other species A enteroviruses such as Coxsackievirus A8 (CVA8) and Coxsackievirus A10 (CVA10). Etiological diagnosis of HFMD and herpangina has classically been dependent upon isolation of viruses and the identification of these either by neutralization tests using Lim-Benyesh-Melnick (LBM) pools or monospecific antisera as well as by immunofluorescence tests using serotype specific monoclonal antibodies [3, 4]. There are at least 66 human enteroviruses known and the cost and labour involved in making a specific identification is high for a syndrome which is generally very mild. Thus the need for virological investigations for HFMD and herpangina has not been considered a necessity by most clinicians, and it is therefore not surprising that not very much effort has been placed on the development of type specific rapid tests for the viruses responsible for causing HFMD and herpangina. In the last few years however, HEV71 has been recognized as the etiological agent in a number of large outbreaks of HFMD in the Asia Pacific region during which alarming numbers of fatalities have occurred. The first of these outbreaks was recognized in 1997 in Sarawak, Malaysia and was followed by consecutive outbreaks in Taiwan in 1998, Perth, Western Australia in 1999 and Singapore and Malaysia in 2000 . The emergence of HFMD as a clinical syndrome which can be associated with severe neurological complications, has emphasized the need to distinguish HEV71 from other enteroviruses causing HFMD. Early identification of HEV71-associated HFMD can provide early warning of potential HEV71 encephalitis outbreaks and assist in directing public health interventions as well as inform clinical decisions. One solution is to use universal enterovirus primers binding to conserved regions in order to amplify a product which can be sequenced and thus achieve serotype identification. Many groups have published methods to do this, using the VP1 gene  as well as the VP4 gene . These methods are applicable to all enteroviruses and require a sequencing step to obtain the information needed to determine serotype. A second approach is to design HEV71 specific primers, thus allowing a preliminary evaluation of the specimen based on the presence or absence of a PCR product of the expected size. Confirmation that the amplified product is from target HEV71 template can be achieved in a number of ways, including hybridization with an internal oligonucleotide probe or by DNA sequencing. The first attempt to use serotype specific primers to identify HEV71 was published by Brown and colleagues in 2000 . These investigators used 2 primer sets, 92S/93A and 159S/162A which generate a 71 basepair and a 484 basepair product respectively. These primers were designed to provide rapid detection of HEV71 positive virus isolates followed by sequencing for genotyping. The primer pair 92S/93A has limited utility because the amplified product has to be resolved on 12% polyacrylamide gels, but we have used the 159S/162A pair extensively since 1997 when the authors generously provided us with the oligonucleotide sequences prior to publication. During the outbreak of HFMD with encephalitis in Sarawak in 1997 [9, 10], this primer pair proved extremely useful in assisting outbreak investigations and informing public health interventions. However, in the inter epidemic years when CVA16 infections have been more common than HEV71 (Cardosa, unpublished data), these primers have proven to be occasionally unreliable, and have been found to misprime and amplify recent Asian CVA16 strains. In this study we attempt to explain how this mispriming occurs by sequencing through the primer annealing sites of newly isolated CVA16 strains. Utilizing this new sequence data, we also describe the design of an improved set of primers for the identification of HEV71 isolates as well as for use with primary specimens. Specimens from patients with a clinical diagnosis of HFMD, aseptic meningitis or encephalitis were submitted to our laboratory for routine virus diagnosis through a public health surveillance programme for HEV71 transmission. Throat, rectal, vesicle and various oral swabs in virus transport medium, stool and cerebrospinal fluids (CSF) were received through the Central Medical Laboratory of Kuching Hospital from 1998 through 2003. All swab specimens were kept frozen at -20°C until tested and all cerebrospinal fluids were frozen at -80°C until tested. All enteroviruses used in this study were isolated from serum, stool, CSF, throat, rectal, vesicle and other oral swabs submitted to the laboratory for virological investigation of HFMD, aseptic meningitis or encephalitis. Enteroviruses were cultivated in rhabdomyosarcoma (RD), 293 or A549 cells. Some strains of HEV71 used here were from a collection used in a previous study . Prototype human adenoviruses were cultivated in 293 or A549 cells, and dengue and Japanese encephalitis viruses were grown using the mosquito cell line C6/36. Serotype identification of enteroviruses was performed using molecular methods as described by Oberste et al. or Ishiko et al. .
RNA was extracted from infected tissue culture supernatants using Tri-Reagent (Molecular Research Center, Inc., Cincinnati, OH, USA) and from primary clinical specimens using the High Pure Viral Nucleic Acid kit (Roche Diagnostics GmbH, Mannheim, Germany). Extracted RNA was stored at -80°C until use. First-strand cDNA synthesis was performed in 10 μl reaction volumes containing 100 units of Moloney Murine Leukemia Virus Reverse Transcriptase (M-MuLV RT) (Promega, Madison, WI, USA) in M-MuLV RT reaction buffer (Promega), 0.5 mM deoxynucleoside triphosphate (dNTP) mix (Fermentas, Hanover, MD, USA), 2 μM of the antisense primer and 6 μl of extracted RNA. The reaction was incubated at 42°C for 1 hour followed by 10 minutes at 70°C and immediately placed on ice. PCR was done in 20 μl reactions containing 2 μl of cDNA, 2.5 units of recombinant Taq DNA polymerase (Fermentas, Hanover, MD, USA) in PCR Buffer containing (NH4)2SO4, 1.2 mM MgCl2, 1 μM of each primer and 0.3 mM of dNTP mix. Amplification of parts of the VP1 gene using primer pairs 159S/162A  and 040/011  was achieved essentially as described by the authors. The complete VP4 gene was amplified as previously described . Amplified products were sequenced in both directions using the respective PCR sense and antisense primers with the exception of the VP4 gene where an internal sense primer, EVP-4  was used instead of the PCR sense primer. Cycle sequencing was achieved using the Big Dye Terminator Cycle Sequencing Kit version 3.1 (Applied Biosystems, Foster City, CA, USA) and reactions were loaded on the ABI377 automated DNA sequencer (Applied Biosystems, Foster City, CA, USA). Human enterovirus serotype identification was achieved using 2 approaches. In the first instance, the VP4 gene sequences obtained were compared with prototype human enterovirus VP4 gene sequences using a phylogenetic analysis . Secondly, the VP1 and VP4 gene sequences were submitted to a BLAST search in the GenBank sequence database (NCBI, Betheseda, MD, USA). We have had no discordant results using both methods on all isolates used in this study. Complete genome sequence of HEV71 strains (Accession numbers: U22521, U22522, AF136379, AF302996, AF352027, AF176044, AF119795, AF119796) and the CVA16 prototype strain G-10 (Accession number U05876) were obtained from GenBank. The VP3 gene sequences from these strains were aligned and a sense primer, MAS01S [5'-ATAATAGCA(C/T)T(A/G)GCGGCAGCCCA-3'], selected. A separate alignment of the VP1 gene from these isolates together with consensus VP1 sequence from the different HEV71 genogroups (Brown et al., 1999; McMinn et al., 2001) and additional VP1 sequences of local CVA16 isolates was prepared. An antisense primer, MAS02A [5'-AGAGGGAG(A/G)TCTATCTC(C/T)CC-3'], was selected to be used together with MAS01S for optimal detection of HEV71 without targeting CVA16. The primers amplified a 376 basepair fragment extending from the VP3 into the VP1 gene. Reaction mixtures for RT-PCR were prepared as described above. The optimal annealing temperature was determined using the Mastercycler Gradient thermocycler (Eppendorf AG, Hamburg, Germany). For the evaluation of this primer pair, 2 μl of cDNA from virus isolates or 5 μl of cDNA from primary clinical specimens were subjected to PCR at 94°C for 5 minutes followed by 35 cycles of denaturation at 95°C, annealing at 55°C and extension at 72°C for 30 seconds each. A final extension at 72°C for 5 minutes was performed after the last cycle. Amplified products were analyzed by electrophoresis on 2% agarose gels containing 0.5 μg/ml ethidium bromide. Alignments of the VP4 and partial VP1 gene sequences were prepared using the ClustalX program . Phylogenetic analysis was performed using PHYLIP, version 3.5 . Dendrograms were constructed with the neighbour-joining method using 1000 pseudoreplicates to generate bootstrap values. We used the TREEVIEW program  to draw the cladograms. Primer pair 159S/162A occasionally misprimes CVA16 strains and generates amplicons the size expected from HEV71. An example of this is shown in Figure 1 where it can be seen that pan enterovirus primers in VP4 amplified a product in all 12 CVA16 samples and 159S/162A amplified 7 of these. DNA sequencing of the VP4 products confirmed that the samples were CVA16. The PCR products generated with 159S/162A were also sequenced and found to be CVA16, thus confirming that the samples affected did not contain both CVA16 and HEV71. Amplification of CVA16 isolates with primer pair 159S/162A. The top panel shows amplification using primer pair 159S/162A. The bottom panel shows amplification using a pan enterovirus primer set in VP4. Lane 1: HEV71 control; Lane 2: water control; Lane 3: SB3091/SAR/00; Lane 4: SB3279/SAR/00; Lane 5: SB2512/SAR/00; Lane 6: SB3333/SAR/00; Lane 7: SB11444/SAR/03; Lane 8: SB3093/SAR/00; Lane 9: SB2116/SAR/00; Lane 10: SB3283/SAR/00; Lane 11: SB2528/SAR/00; Lane 12: SB2905/SAR/00; Lane 13: SB2486/SAR/00; Lane 14: SB2934/SAR/00. "+" indicates specimens positive using 159S/162A primers. The expected position of the amplicons are indicated by the arrows. MW (bp) marks the lane containing the molecular weight markers in basepairs. In order to understand the reason for this mispriming, we sequenced 8 local isolates of CVA16 through the primer binding sites to determine if there had been any mutations that could account for this. Very few sequences of CVA16 strains have been deposited in GenBank, and the prototype strain G-10 was used in the design of the original published set of HEV71 specific primers, 159S/162A . The strains we have isolated since 1998 have not shown very much change in the primer binding regions, but a few nucleotide differences may have been critical in allowing mispriming to occur. Figure 2 shows an alignment of different genogroups of HEV71 and CVA16 prototype G-10 with the consensus sequence of local CVA16 strains in the primer binding regions. All our local CVA16 strains show complete identity with the sense primer 159S but we infer that this primer was not meant to specifically bind to HEV71 since even the prototype CVA16 G-10 had only one nucleotide difference. Alignment of HEV71 and CVA16 genomes in the binding location of primer pair 159S/162A. Dots "." indicate nucleotide identity with the primer sequence; In degenerate positions, K is G or T; R is A or G; Y is C or T. The boxed region is the position with the potential to bind to HEV71 template leading to extension and amplification. However, the antisense primer was meant to be the HEV71 specific primer of the pair. There were 8 mismatches of the 20-nucleotide primer sequence in the CVA16 G-10 primer-binding site. Our recent CVA16 strains have 7 mismatches, but a mutation in the third position from the 3' end generates a four base identity (boxed in Figure 2) that could allow binding and extension of the primer, thus leading to misidentification of CVA16. New HEV71 specific primers were designed by comparing sequences of recent local CVA16 and HEV71 isolates with other sequence data available in GenBank (Accession numbers: U22521, AF136379, U22522, AF352027, U05876). The program Lasergene (DNASTAR, Inc., Madison, WI, USA) was used to align and compare sequences for determination of potential primer binding regions. 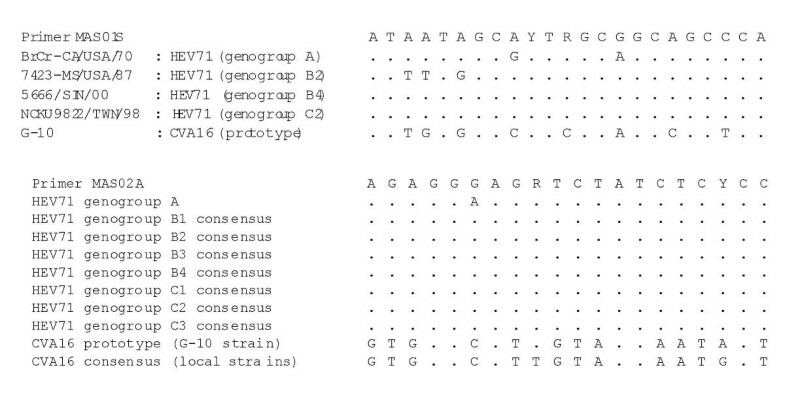 Figure 3 shows an alignment of different HEV71 genogroups, CVA16 prototype strain G-10 and the consensus sequence of recent local CVA16 strains in the regions selected for the new primers. The sense primer MAS01S binds to a region in VP3 just upstream of the VP3/VP1 junction. The antisense primer MAS02A binds to a region in VP1, giving a predicted amplicon size of 376 basepairs. In the design of these primers we attempted to use representative sequence from all recent HEV71 genogroups [11, 16] as well as earlier strains . Alignment of HEV71 and CVA16 genomes in the binding location of primer pair MAS01S/MAS02A. Dots "." indicate nucleotide identity with the primer sequence; In degenerate positions, R is A or G; Y is C or T. Primer MAS01S anneals to nucleotide position 2352 to 2375 while MAS02A anneals to nucleotide position 2728 to 2709, both relative to BrCr-CA/USA/70. Primer pair MAS01S/MAS02A was then evaluated using viruses isolated from specimens collected from patients with HFMD, aseptic meningitis or encephalitis. A total of 218 viruses (204 enteroviruses) were tested. Two individuals performed all the testing and were blinded to the source and identity of the samples. Table 1 shows that the improved HEV71 specific primer pair amplified all 39 HEV71 isolates tested and none of the 165 other enteroviruses (38 CVA16, 127 others, representative of human enterovirus species A, B and C). Specific information about the isolates used can be found in Additional file 1. We also tested these primers on cell cultures containing 14 prototype adenoviruses and flaviviruses, and none were positive. All PCR products generated were sequenced to confirm HEV71 specificity. Enterovirus isolates tested by RT PCR using primer set MAS01S/MAS02A. Aliquots of throat, rectal and vesicle swabs yielding HEV71 isolates when inoculated into cell culture were selected to test the utility of the primers in detecting HEV71-containing primary specimens. Specific information about the primary specimens used in this evaluation can be found in Additional file 2. Figure 4 shows a representative agarose gel of primary samples tested using primer set MAS01S/MAS02A. As shown in Table 2, when we used fresh primary specimens within 2 months of collection, 27 of 28 (96.4%) specimens tested were positive using MAS01S/MAS02A. However, the sensitivity of the assay dropped drastically when older stored specimens were used. Only 30% of specimens between 3 months and one year old, and 18% of specimens older than 2 years were positive when tested. When testing primary clinical specimens, it is important to test them as soon as possible after collection. Amplification of HEV71 genome using primer pair MAS01S/MAS02A on primary specimens. Lane 1: HEV71 control; Lane 2: water control; Lane 3: 32653; Lane 4:32642; Lane 5: 31302; Lane 6: 31293; Lane 7: SB12873; Lane 8: SB12286; Lane 9: SB10365; Lane 10: SB10126; Lane 11: SB10125; Lane 12: SB10122. "+" indicates amplification from primary specimen. The expected position of the 376 basepair amplicon is indicated by the arrow. "-" indicates no amplification. All primary specimens used here yielded HEV71 in cell culture. MW (bp) marks the lane containing the molecular weight markers in basepairs. Utility of primer set MAS01S/MAS02A for direct detection of HEV71 in primary specimens. We sequenced all amplicons generated using improved primer pair MAS01S/MAS02A in order to confirm the identity of the positive signals. Although the primary goal of this study was to design and test an improved primer set for rapid detection of HEV71, we also considered whether the sequenced PCR product would be useful for genogroup determination since the product generated represented approximately 30% of the VP1 gene. The cladogram shown in Figure 5 was generated from the relevant gene region of representative sequences of all known HEV71 genogroups  using sequence data available in Genbank (Accession numbers: AF376105, AF376117, AF376077, AF376119, AF376101, AF376072, AF376066, AF376067, AF376111, AF009530, AF009540, AF009535, AF135886, AF135880, U22521, AF135941, AF376103, AF135949, AF009548, AF376098, AF376081, U05876). Using this shorter segment of VP1 gene sequence we were able to correctly identify all the genogroups described when using the complete VP1 gene in the analysis, suggesting that our improved primer set may also be used as a screening tool to provide rapid genogroup information. HEV71 dendrogram generated using a 270 nucleotide segment of the VP1 gene. Sequences used to generate this tree were the 270 nucleotide segment which would be amplified using primer pair MAS01S/MAS02A. CVA16 G-10 has been used as the outgroup. In this study we sequenced the VP4 gene of all CVA16 strains used in order to make serotype identifications. 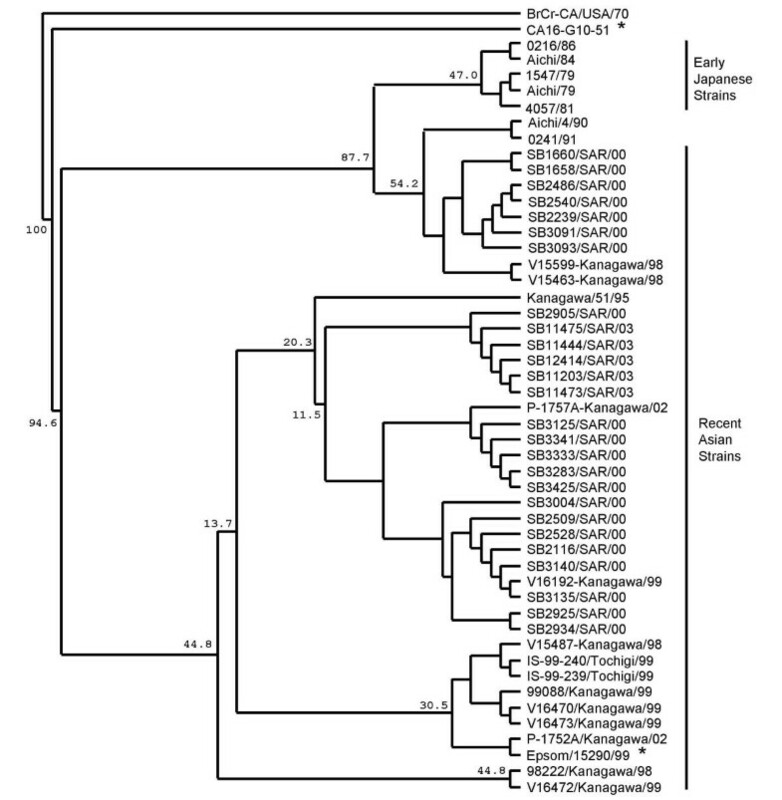 We have used representative data to examine the phylogenetic relationships of these local strains with other recent and historical strains isolated in Asia (Accession numbers: E11659, AB053285, AB094771, AB094773, E11657, AB053287, E11656, AB053286, E11658, AB061505, AB094784, AB094776, AB094772, AB094781, AB094780, AB094782, AB094777, AB094779, AB094783, AJ297109, AB094775, AB094778, U22521, U05876. Accession numbers for local sequence data: AY536013 to AY536038). Since sequence data from Western hemisphere strains is scarce in GenBank, we have only been able to include the prototype CVA16 G-10 and a strain isolated in the UK (Epsom/15290/99) in the analysis for comparison. Figure 6 shows that the Asian strains are clearly distinct from the prototype CVA16 G-10, forming a cluster strongly supported by a bootstrap value of 94.6. The CVA16 G10 strain has a 78 to 82% nucleic acid identity to the Asian strains but the UK strain Epsom/15290/99 is more closely related to the Asian strains isolated since the 1990s. The Asian strains tend to be closely related to each other. A likely exception is a cluster of Japanese strains isolated between 18 and 25 years ago. 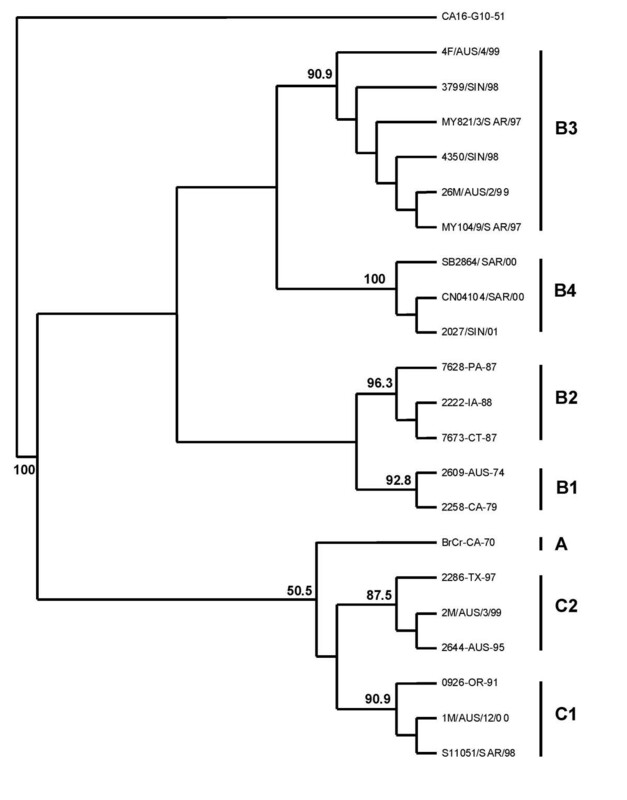 A cluster of modern Asian strains isolated in 1990, 1991, 1998 and 2000 appears to be closely related to these viruses, the segregation of both these clusters being supported by a bootstrap value of 87.7. A second group of strains isolated from 1995 to 2003 appear to form a different cluster, but more data is still needed before any conclusions are made about the strength of this association since the bootstrap values here are rather weak. Thus it would appear from our analysis at this stage that the Asian strains all fall into a single genogroup distinct from the prototype G10 strain isolated in 1951. CVA16 dendrogram generated using the 207 nucleotide VP4 gene. BrCr-CA/USA/70 has been used as the outgroup. The asterisks (*) denote Western strains. The emergence of HEV71 as an important pathogen in the Asia Pacific region since 1997  has emphasized the need to be able to rapidly identify and provide early warning of HEV71 transmission in a community. This is best done by surveillance of HFMD, a disease also caused by the more innocuous CVA16 and other species A human enteroviruses. The first pairs of primers for this purpose were described by Brown and colleagues  and one of these pairs (159S/162A) has been extensively used to investigate recent HEV71 outbreaks. The heightened awareness of the importance of HFMD surveillance has also led to an increased isolation and study of CVA16 strains and the realisation that these important primers can occasionally misidentify CVA16 as HEV71 due to a single nucleotide change that has unfortunately arisen in recent Asian CVA16 strains. We have used new data to design an improved primer set that is highly specific for HEV71. The new primers MAS01S/MAS02A are useful in identifying HEV71 isolates and in providing preliminary genogroup information when employed together with DNA sequencing of the PCR products. These primers may also be useful in the rapid indication of the presence of HEV71 genome in throat, rectal and vesicle swabs. If specimens are tested as soon as possible after collection, the new primers can reliably provide screening information about HEV71. This would be especially important in surveillance programmes since a rapid public health response depends on rapid identification of a threat. Following the publication of the 159S/162A primers by Brown et al. , other groups have also published methods for the specific identification of HEV71 by RT PCR [18, 19]. However, the primers described by Brown et al. remain the most widely used VP1 based primers for HEV71 detection [9, 20–24] and it is for this reason that we have documented the problem arising from mispriming recent local Asian strains of CVA16 using these primers. To our knowledge, VP1 based primers described by other groups have not been generally used, and we have not attempted to make a direct comparison of our primer set with these. Our primers are degenerate in only 2 positions in each primer, and are therefore robust and likely to generate amplicons in specimens with low numbers of templates such as might be the case with primary clinical samples. It would be a tremendous advantage if we could directly identify HEV71 in CSF without having to wait for virus isolation. We have retrospectively attempted this on a limited number of CSF collected during the last HEV71 transmission season (2003) but have been unable to demonstrate the presence of enterovirus template using pan enterovirus primers or MAS01S/MAS02A, although we have been able to successfully identify HEV71 containing primary specimens from throat and rectal swabs. We intend to test the utility of these primers on CSF samples prospectively during our next HEV71 transmission season. We have used new sequence information to explain why important HEV71 specific primers designed in the last decade have begun to misidentify recent Asian strains of CVA16. The new data have been used to design improved HEV71 specific primers able to correctly identify HEV71 isolates without mispriming CVA16 templates. This new primer set is also able to identify HEV71 containing primary specimens with a high degree of sensitivity only when fresh specimens are used, and can therefore be employed as a screening tool for surveillance of HEV71 and in outbreak situations. We are grateful to Dr Betty Brown, Centers for Disease Control, Atlanta GA, USA for assessing our primer set against Western hemisphere strains of CVA16 and HEV71 isolated between 1999 and 2003. We are also grateful to the Sarawak Health Department for providing specimens from the public health virus surveillance programme. This study was supported by grant 06-02-09-002/BTK/ER/003 from the Ministry of Science, Technology & the Environment, Government of Malaysia. DP, YP and MJC conceived of and planned the study. YP, WA and MJC propagated the viruses. DP, WA and CST performed all the RT PCR and sequencing. DP performed all the molecular analysis. All authors contributed to the writing of the manuscript, but the original draft was written by MJC. All authors read and approved the final manuscript.